With roulette easily being one of the most popular games found at the casino, it comes as no surprise that there are a number of gamblers wagering vast amounts of money in the hopes of getting lucky, leaving behind many tales to be told from the roulette wheel. Roulette has been involved in the media and in films quite a lot over the years, with story lines based around the highs and lows experienced at the roulette table. Whilst these fictional stories may be entertaining to watch, they do not quite compare to the stories that are told from real life wagers in roulette. Almost any experienced gambler will be able to tell you about a time when the same number came up 5 times in a row, or the wheel landed on the same colour for 20 spins straight, but it is the big bets and big wins that take the limelight over the obscurities of probability every time. Nothing quite beats a good success story. There are just a handful of famous roulette bets and gamblers that will go down in history for their great wins (and sometimes losses) with their equally as exciting stories. 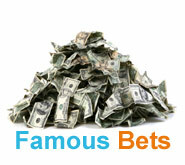 Below are the most popular stories and famous bets to ever come from the roulette wheel... I am sure that you will find them as entertaining as I did.